Question: Well, I don't know if I'll get a response, I assume you and your team get a million of these a day, but it's worth a try. I have a 9 month old beautiful baby boy Owen. Owen has never slept a night in 9 months. He wakes up several times a night screaming and crying and the ONLY solution is for me to nurse him and he goes back to sleep. It's important to note that during the day, he is the happiest little baby! His sleep deprivation at night doesn't seem to be affecting him. We have done all of your recommended helpful tips: we put him to bed early, I don't breastfeed him to sleep, we have a nighttime routine that we do every single night, which includes me nursing him, then dinner (solid foods), then a warm bath, then into PJ's, read 2 books, give him the pacifier, turn on a white noise machine, give him his lovey, and put to bed AWAKE. He doesn't cry, he rolls around in his bed for 10 minutes then falls asleep on his own at 7:30 pm. Then every night he wakes up at 10 pm, then a couple hours later, then a couple hours later, etc. then lately up for the day at 5 am. When he wakes up, he immediately starts screaming and crying, my husband can do nothing, it just delays me coming in, he won't take the pacifier back, he will cry until I give him my breast, here is the kicker, he only breastfeeds for a minute or two, so I know he's just using me to pacify. I just re-read The No-Cry Sleep Solution for the fifth time :) and I don't know what to do because Elizabeth Pantley's Gentle Removal Plan doesn't really apply to me, as he is already only nursing for such a short amount of time then I put him back in his crib, and he is asleep for another hour or two until the next wake-up call. I am completely exhausted now, I have been able to function up until this point, but lately it is affecting my whole life (I work in an office Monday-Wednesday) and home Thursdays and Fridays with Owen. Another thing to note, he is a great napper, he goes down easily for naps twice a day and sleeps for 2 hours for his first morning nap, and usually an hour and a half for his second afternoon nap. My husband thinks the only solution, because he nurses for such a short amount of time in the night, is to stop nursing him at all when he wakes up and let him cry until he realizes that his every cry is not going to result in mommy coming in and nursing him, and I want to avoid him crying as much as possible. But he is already crying every night several times when he wakes up, so maybe that is the only solution. Any help you can offer is greatly appreciated. 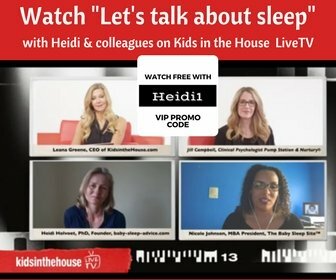 Heidi's Answer: Dear Lacey, First of all let me say how great you are doing with all the good sleep habits in place. And very good of your son to settle so well when put down awake at 7.30pm, and when napping. I know that does not solve your nights yet, but it is a good start and actually a very important skill for him to have! To start with the hardest thing, what could cause his wakings? Check for noises in or near his bedroom (maybe from the street, or neighbours), or lights, could he be cold or hot (does he have a wearable blanket or sleeping bag? ), is he teething, do you notice any baby separation anxiety symptoms during the day? Could he be hungry? (I guess not since he has a good dinner, but does he also eat well during the day?) Is his diaper wet often when he wakes? Any to these could cause many awakenings, or have caused them in the past and have left him with these sleep patterns installed now. 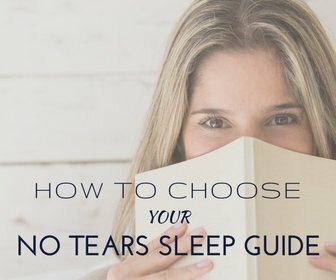 My dedicated book No-Tears Sleeping Through the Night has a quite complete list of possible causes, and dedicated techniques to remedy each of them. First thing to try (if you haven't already) is to wait for a few moments before going to him. There is a chance that he cries in his sleep and will go back to sleep if you do not go in (and truly wake him). With this I do not mean to let him cry, let alone let him cry it out, but just to give it a couple of tries and see if he does not go back to sleep magically after a minute or so. After that, I see two main options: we work on reducing the amount of his awakenings, or ....you 'let it be'. 1. Let's start with let it be, an option I guess you weren't waiting for. But, if that would feel right to you, nurse him at his first whim, reducing the awake time as much as possible. So no struggle, no worrying or feeling guilty for you just quick & efficient nursing and back to sleep. No lights, no diaper change, ... so you are both awake a minimum of the time. That can improve your sleep dramatically and give him the chance to outgrow it (probably in a few weeks). - You know the 'timing' of his awakenings quite well, 10pm, ... Then, about 10 minutes before that, go to him very quietly. Place your hand on his tummy, or his forehead, or anything you know usually calms him down without startling him. Stay there and keep doing this for about 15 minutes. The idea is to 'take him through' to the sleeping cycle without waking up. Do the same at the next awakenings (I know this may mean a few extra tough nights for you, but results may come quick so it is definitely worth the extra effort for a few nights). 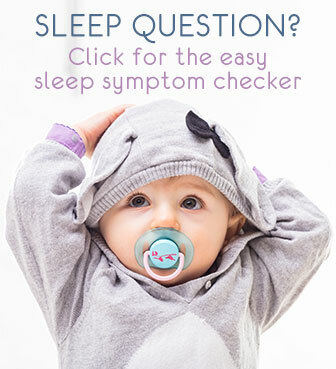 This may not work each time, and not from the first time, but with a bit of patience this can be very efficient to settle his sleep patterns. * You can still try the gentle removal move but a very short version. If he starts dozing off after just about 10 seconds, start doing the move after 5 or 7 ... anything to be able to put him back down not fully asleep. Try this at each night nursing. * Then, to reduce the number of times he wakes to nurse: pick one awakening to eliminate first. Only when that one is gone, move on to the next one. To start with I suggest you pick the second one. So the 10pm you go in straight away, nurse him (with gentle removal) and put him back to sleep. Next awakening do anything and everything to help him back to sleep, except nursing: offer a sip of water instead of the nursing, soothe him by rocking, singing, walking, swinging, have your husband persist (I know it's hard for him too but encourage his confidence or let him 'practice' during the day? or practice by putting to bed at 7.30pm? ), ... anything that is not nursing. This may take longer than usual, but don't go spending an hour doing this either. If really nothing works this time, nurse him to sleep and then try again the next night. When you got rid of this awakening, move on to the next one (maybe the third or fourth) where you do the same. In the meantime do try to take good care of yourself. Allow yourself as many rest moments you can get: when he naps on your free days don't do any chores but rest or nap yourself, or simply do something you enjoy (listen to music, read a book, do yoga, ...). Don't do house work when he's in bed at night, but take an early night as often as you can: between 7.30pm and 10pm can give you 2 extra hours of sleep. And be confident, you will get more sleep and start feeling better! My son Max, second child and still being breastfed exhibits all the same behaviour patterns as Lacey's son Owen. I also follow Elizabeth Pantley's no cry ideas but my little man just wants to be close to me all the time. I have decided that it really doesn't matter whether I have to nurse max to sleep or even bring him into bed with me for a cuddle on some nights to get a block of sleep. I brought him in last night and surprise surprise he slept from 10pm to 4.30am and then went back into his cot after a feed until half seven. My daughter who is now 3 and sleeps happily in her own bed all night used to be much the same. In fact I can remember being in tears trying to get her back into her cot when I knew she would sleep if I nursed and cuddled her. I am sure that seperation anxiety causes most of these problems. I too have the problem that max has severe eczema which wakes him up poor thing. Perhaps we should remember that this time flies by, there is no need to prove anything to anyone by being up all night desperately trying to get our babies to conform. I'm just going to keep trusting my instinct and do what feels right. I really felt for Lacey as i know how distressing it is but she is clearly an excellent mother and I'm sure her son will turn out to be well adjusted and happy because of all her efforts. I agree that going to bed earlier and grabbing some time for yourself is fundamental when nursing a baby like this though. Sounds like Lacey has a supportive husband who can give her some time to lie in at the weekend!? I found your advice to Lacey quite useful myself and will have a go as I think Max should be encouraged to have a healthy relationship with his cot and bedroom even if he ends up in my room some of the time!! Thank you Heather for your kind advice and for reaching out to Lacey. Perhaps we should remember that this time flies by, there is no need to prove anything to anyone by being up all night desperately trying to get our babies to conform. I'm just going to keep trusting my instinct and do what feels right. are so valuable: trusting your instincts and looking after of your baby's needs with care and consideration, all the while keeping 'good bedroom habits' in the back of your mind is very powerful and thE way to get the most and best sleep, also in the long term. I hope, and trust, all goes well for each fo you. He sleep with me on my bed still he awakes almost every hour to nurse. I feed him while lying on the bed and he nurse for some time then turn his head away then again nurse for some seconds and turns away and so on... he does this until either he is full or tired(I dont know). have you checked for medical causes?